Investing in a new roof is a major undertaking, and one that many Colorado homeowners would rather put off. While you can benefit from cost-effective roof repairs from a local expert for years, eventually, it will prove much more advantageous to go with replacement. Homeowners looking for professional roof replacements in Loveland, Fort Collins, and along the Front Range can benefit from the experience and professionalism offered by Schroeder Roofing. Since 1977, our Northern Colorado roofers have worked to provide the best results for all of our clients, relying on personalized approaches to complete the job on time and on budget. Roof replacement for your Loveland or Fort Collins home can provide an immediate boost to its curb appeal. It can help to remember that your roofing system comprises a major part of your home, and can impact the overall look of your property. Coloradans who put a lot of sweat and tears into their landscaping may find that their cracked, curling roof roof still steals the show. Even minor roof repairs can do much to improve the aesthetics of your home. Those on the fence about complete roof replacements should keep in mind that the value of a new cap can recoup much of the up-front costs. New roofs are meant to last decades, making your Front Range property much more valuable when it comes time to sell. When combined with a full home renovation, your roof replacement may prove to be a beautiful choice! Schroeder Roofing’s professional approach to all of our roofing services helps to ensure that you are left with a precise fit. Over time, changes in your home’s structure and the varying Colorado weather can cause a number of cracks and holes to develop, quickly sapping your home’s thermal barrier. 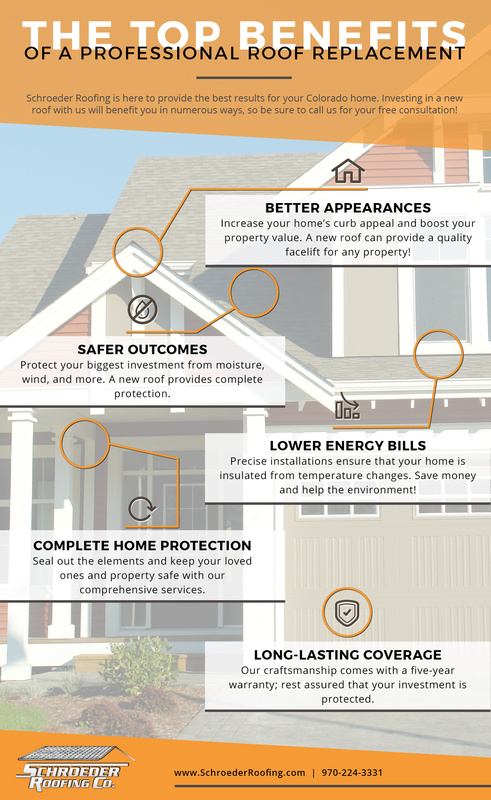 A new roof replacement can provide a brand-new seal against the elements, providing a major benefit for many homeowners in terms of energy costs. A new roof (or quality repairs) will also help to insulate your home better from heat loss, increasing comfort in addition to saving you money over the long term. Homeowners that neglect their roofing systems beyond the point of repair faces certain safety concerns. Most home designs rely on their roof structures for support and stability, providing protection for the frame in the process. Deteriorating roofs will fail to provide support during heavy storms, and the moisture that infiltrates can also cause advanced degradation. Instead of risking dangers and costly repairs for your home, be sure to reach out to a roofing professional for a safety inspection. Our roofing contractors are trained to provide complete results for jobs of all shapes and sizes, and you’re sure to be left with complete coverage through every season. It’s beneficial to know that your home, which is likely your biggest asset, is protected from rain, wind, and other dangers present throughout Colorado’s changing weather patterns. Schroeder Roofing is here to deliver the best defense from the elements. Contact us today to schedule your inspection and quote! Peace of mind is important when it comes to the membrane keep your loved ones and your valuables safety. Investing in residential roof repairs or a replacement is a big undertaking, and one that should provide valuable protection for you and your loved ones. Schroeder Roofing provides a five-year warranty on our craftsmanship, with material warranties varying and often longer in length. Our Colorado roofing contractors are licensed, insured, and ready to get to work. Schroeder Roofing is proud to be your trusted source for roof replacement in Loveland and the surrounding areas. Contact us today to schedule your free quote and inspection!